Lock. Every. Single. Door, Cabinet, and Drawer. Decided to take a break from getting the house clean before Gracie’s momma gets home. Been living as a bachelor this weekend (with my 13 year-old autistic daughter in tow). Thought I’d put up a post about what’s been going on lately. Between Gracie’s pica and elopement issues, it’s a wonder I haven’t had a nervous breakdown. Very difficult to relax whenever Gracie has free reign to roam through the kitchen, family room, and her bedroom. The living room, her sister’s bedroom, and our bedroom are off-limits to Gracie, as those areas haven’t been Gracie-proofed. Gracie-proofed… that’s cause for some mirthless laughter between Kristine and I. In the past we’ve gone with Gracie to visit the homes of some of our friends and family, with assurances (in their words, not ours) that they have Gracie-proofed their homes in preparation for the visit. Their intentions are good, but I’m sorry, most have no idea of what must be done to secure Gracie’s safety and our peace of mind. Take the fridge, for example. Just last week Gracie got into the fridge without me noticing. What I did notice is the unnatural quiet that ensued after seeing her leaving the family room. I went to her bedroom to check on her, and found her with a bottle of liquid, chocolate coffee creamer. It was all over her, her bed, and her bedroom floor. So, so aggravating. You don’t realize how sticky that stuff is until you have to clean it up. And I had the fridge doors tied together with a hand towel in a square knot. That little trick worked for a while, until Gracie figured out how to untie the knot. Before tying the fridge doors together, I kicked around some ideas to keep Gracie from pilfering the fridge. I had seen some off-the-shelf items in the past for securing fridges, but they didn’t look simple or practical enough to work with my fridge. So I went to the hardware store and got the parts and material I thought I’d need to accomplish what I was looking for. I ended up using a two-part epoxy to bond a latch post safety hasp to the tops of the fridge doors. Thought I was so smart, until Kristine forgot to unlock the hasp. Snapped it clean off the door. Yeah, that lasted about all of two days. So I broke down and bought the off-the-shelf item intended for securing fridges from toddlers (and an always-hungry 13 year-old). Turns out the device works! Although I don’t expect for long. Gracie has attempted to open the fridge a few times, and she’s very strong. I already see fatigue in the plastic parts that lock together, and it’s been less than a week. It doesn’t help that I forget about the lock too, and almost yank the door handle off the fridge when I go to open it. This morning I was busy drilling holes in some more of our kitchen cabinets to install child locks, lest Gracie get into the bleach, Drano, and dishwasher detergent to mix up some lethal cocktail. Would really rather not have to call Poison Control again. I joke (a little), but seriously, most of the cabinets were already secured. Then she discovered which ones weren’t, and started taking all the items out of those cabinets. Arrrggghhh!!! Stop, Gracie! She thinks it’s funny. Maybe it’s her way of getting attention, who knows? This morning I also installed a lock on one of her dresser drawers, as recently she had taken all the clothes out of a drawer. I walk into her room to find that she has clothing strewn all over the place. Little stinker! I’m fixing her one cabinet, one drawer, one door at a time. Last week I dropped fifty bucks on a keyed, exterior door knob to put on Gabby’s bedroom door. Fifty bucks! Because simply turning the original, interior door knob around (so it could be locked from the outside) was no longer sufficient. Gabby had no way of locking the door when she was in her room, and Gracie started dropping in on Gabby. Now Gabby uses a key to get into her room, and can lock the door from the inside when she’s in her room. A few weeks ago I hit upon the brilliant idea of using slide latches on our bi-fold pantry doors to secure them. I agonized over how I was going to secure these doors. All I had to do was orient a latch vertically and attach it at the top of the door, next to where it folds. The latch pin fits perfectly behind the casing (to lock the door). I had been using a bungee cord to tie the doors together, and keep Gracie from raiding the pantry as well. Three latches on three bi-fold doors later, and the pantry is secured! Booyah! I’m getting good at this, I must say. 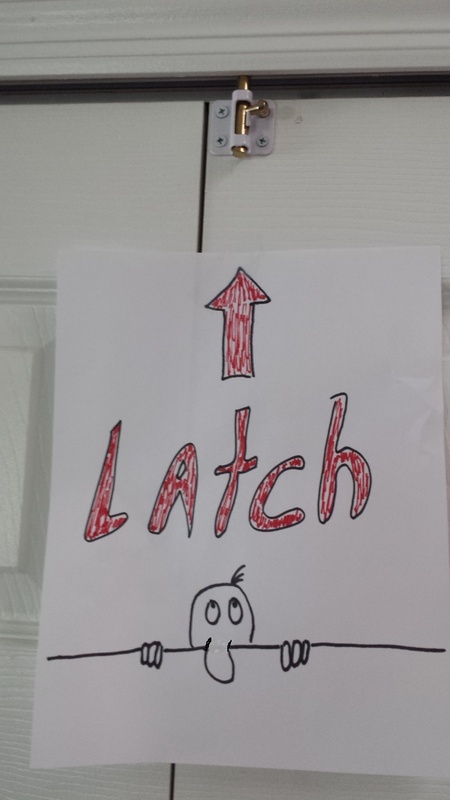 Had to post signs on the doors, though, to remind ourselves about the latches. And then there’s the matter of securing the house to keep Gracie from escaping. As mentioned earlier, Gracie has free reign of the kitchen and family room. Most of the time. When Gracie goes to bed we contain her to her room via a baby gate. From her bedroom she has four barriers preventing her from escaping our home via three separate methods of egress, i.e., the front patio door, the backyard fence gate, and the garage door. I won’t bore you with the details, but suffice it to say, Gracie has to get through four barriers to escape our home. She’s managed to make it through three of them at least twice in the past. Once, I opened the garage door after getting home from work, and there she was, standing in the garage. And the other time, after another period of unusual quiet, I went looking for her and found her in the backyard, looking out over our fence, standing next to the gate. My parents have been after to look into some sort of alarm, one that would let us know if Gracie has escaped. I think I’m going to have to look into that. This entry was posted in Issues and tagged autism, elopement, pica, securing cabinets around autistic children, securing doors, securing drawers. Bookmark the permalink. Wow! I admire your and Kristine’s patience and persistence so much. I would think the two of you having moments of full relaxation are few and far between. We miss you guys and continue to lift your family in prayer. A little update on Tyler : he got married last year ( to a wonderful girl who knows about his autism “quirks” and routines and could care less!) They live in El Paso Texas . He earned an associates degree in Criminal Juctice and works for a security company. (And “they” said he’d never be independent!